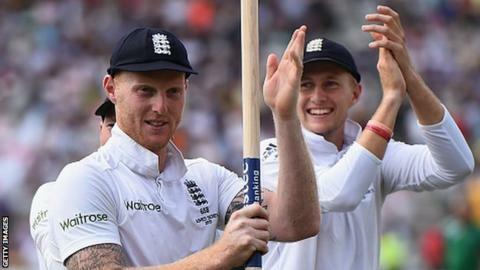 England must make people "fall in love" with Test cricket again, says newly appointed vice-captain Ben Stokes. Yorkshire batsman Joe Root has been named as new Test captain after Alastair Cook resigned after more than four years in charge. "We need to win but we want to perform in a manner that makes people want to come and watch us," Stokes said. Root's first Test match as England skipper is against South Africa at Lord's beginning on 7 July. The 26-year-old has stepped up from vice-captain, with Durham all-rounder Stokes, 25, filling the role as his deputy. "Test cricket is the pinnacle and we need people to fall in love with it again," added Stokes. Discussing his elevation to vice-captain, he added: "Everything I do is to win and being vice-captain won't change me as a person or as a player. "I want to be involved in all aspects of the game, whether it's hitting the winning runs or taking the final wicket. I have always wanted to be in the middle of it. "Being vice-captain I will have to bring a mental and supportive side too. If I am not involved in the game then I will have to add my tactical input. "I have been more vocal over the last year but I only speak when I think something needs to be said. I'm not one for cliches. "Just being vice-captain doesn't give me the right to say whatever I want." England have lost six of their past eight Tests, the most recent by an innings and 75 runs against India in December as they slipped to a 4-0 series defeat. Analysis and opinion from the BBC's cricket correspondent.